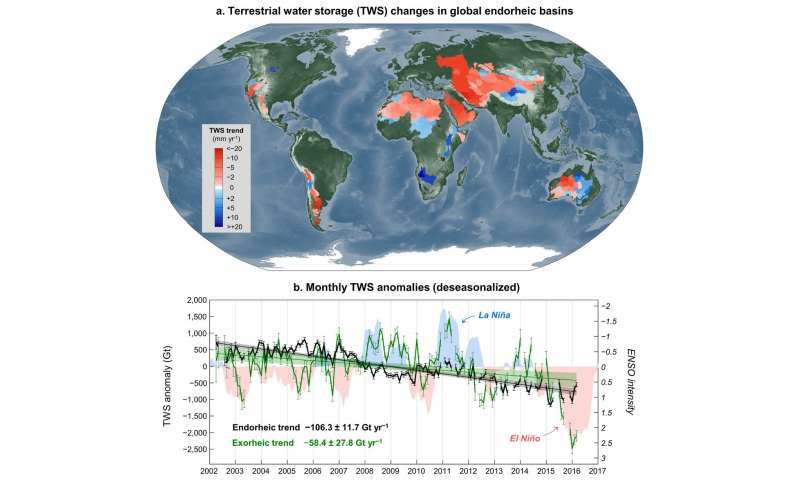 The study, "Recent Global Decline in Endorheic Basin Water Storage," was carried out by a team of scientists from six countries and appears in the current issue of Nature Geoscience. "Water resources are extremely limited in the continental hinterlands where streamflow does not reach the ocean. Scientifically, these regions are called endorheic basins," said Jida Wang, a Kansas State University geographer and the study's lead author. "Over the past few decades, we have seen increasing evidence of perturbations to the endorheic water balance," said Wang, an assistant professor of geography. "This includes, for example, the desiccating Aral Sea, the depleting Arabian aquifer and the retreating Eurasian glaciers. This evidence motivated us to ask: Is the total water storage across the global endorheic system, about one-fifth of the continental surface, undergoing a net decline?" Using gravity observations from NASA/German Aerospace Center's Gravity Recovery and Climate Experiment, or GRACE, satellites, Wang and his colleagues quantified a net water loss in global endorheic basins of approximately 100 billion tons of water per year since the start of the current millennium. This means a water mass equivalent to five Great Salt Lakes or three Lake Meads is gone every year from the arid endorheic regions. Surprisingly, this amount of endorheic water loss is double the rate of concurrent water changes across the remaining landmass except Greenland and Antarctica, Wang said. Opposite to endorheic basins, the remaining regions are exorheic, meaning streamflow originating from these basins drains to the ocean. Exorheic basins account for most of the continental surface and are home to many of the world's greatest rivers, such as the Nile, Amazon, Yangtze and Mississippi. Wang noted that the signature of water storage changes in exorheic basins resembles some prominent oscillations of the climate system, such as El Niño and La Niña in multiyear cycles. However, the water loss in endorheic basins appears less responsive to such short-term natural variability. This contrast may suggest a profound impact of longer-term climate conditions and direct human water management, such as river diversion, damming and groundwater withdrawal, on the water balance in the dry hinterlands. This endorheic water loss has dual ramifications, according to the researchers. Not only does it aggravate water stress in the arid endorheic regions, but it could also contribute to a significant factor of global environmental concern: sea level rise. Sea level rise is a result of two main causes: thermal expansion of sea water as a result of increased global temperature, and additional water mass to the ocean. "The hydrosphere is mass conserved," said Chunqiao Song, researcher with the Nanjing Institute of Geography and Limnology, Chinese Academy of Sciences, and a co-lead author of the study. "When water storage in endorheic basins is in deficit, the reduced water mass doesn't disappear. It was reallocated chiefly through vapor flux to the exorheic system. Once this water is no longer landlocked, it has the potential to affect the sea level budget." This animation shows terrestrial water storage changes in global endorheic basins from GRACE satellite observations, April 2002 to March 2016. In the top image, terrestrial water storage trends — in millimeters of equivalent water thickness per year — for each endorheic unit are highlighted, followed by animated monthly terrestrial water storage anomalies, also in millimeters. The bottom image shows monthly net terrestrial water storage anomalies in gigatonnes, in global endorheic and exorheic systems — excluding Greenland, Antarctica and the oceans — and linkage to the El Niño-Southern Oscillation, right axis. Terrestrial water storage anomalies are relative to the time-mean baseline in each unit or system, with removal of seasonality. For comparison, 360 gigatonnes of terrestrial water storage equals 1 millimeter of sea level equivalent. Courtesy of Jida Wang. Despite an observation period of 14 years, the endorheic water loss equals an additional sea level rise of 4 millimeters, the study found. The researchers said this impact is nontrivial. It accounts for approximately 10 percent of the observed sea level rise during the same period; compares to nearly half of the concurrent loss in mountain glaciers, excluding Greenland and Antarctica; and matches the entire contribution of global groundwater consumption. "We are not saying the recent endorheic water loss has completely ended up in the ocean," said Yoshihide Wada, deputy director of the water program at the International Institute for Applied Systems Analysis in Austria and a co-author of the study. "Instead, we are showing a perspective of how substantial the recent endorheic water loss has been. If it persists, such as beyond the decadal timescale, the water surplus added to the exorheic system may signify an important source of sea level rise." By synergizing multi-mission satellite observations and hydrological modeling, Wang and his colleagues attributed this global endorheic water loss to comparable contributions from the surface—such as lakes, reservoirs and glaciers—as well as soil moisture and aquifers. "Such comparable losses are, however, an aggregation of distinct regional variations," Wang said. "In endorheic Central Eurasia, for instance, about half of the water loss came from the surface, particularly large terminal lakes such as the Aral Sea, the Caspian Sea and Lake Urmia, and retreating glaciers in High Mountain Asia." While glacial retreat was a response to warming temperature, water losses in the terminal lakes were a combined result of meteorological droughts and long-term water diversions from the feeding rivers. The net water loss in endorheic Sahara and Arabia, on the other hand, was dominated by unsustainable groundwater withdrawal, according to the researchers. In endorheic North America, including the Great Basin of the U.S., a drought-induced soil moisture loss was likely responsible for most of the regional water loss. Despite a lesser extent, the surface water loss in the Great Salt Lake and the Salton Sea was at a substantial rate of 300 million tons per year, which was partially induced by mineral mining and diversion-based irrigation. "The water losses from the world's endorheic basins are yet another example of how climate change is further drying the already dry arid and semi-arid regions of the globe. Meanwhile, human activities such as groundwater depletion are significantly accelerating this drying," said Jay Famiglietti, director of the Global Institute of Water Security, Canada 150 research chair in hydrology and remote sensing at the University of Saskatchewan, Canada and co-author of the study. Wang said the team wants to convey three takeaway messages from their research. "First, water storage in the endorheic system, albeit limited in total mass, can dominate the water storage trend in the entire land surface during at least decadal timescales," Wang said. "Second, the recent endorheic water loss is less sensitive to natural variability of the climate system, suggesting a possible response to longer-term climate conditions and human water management. "Third, such a water loss in the endorheic system has dual ramifications, both to regional water sustainability and to global sea level rise," he said. "These messages highlight the underrated importance of endorheic basins in the water cycle and the need for an improved understanding of water storage changes in the global hinterlands." "Despite an observation period of 14 years, the endorheic water loss equals an additional sea level rise of 4 millimeters, the study found." What does this sentence mean ? Is it alluding to some link between observation period and sea level rise. I'm confused. This is ominous. Water being sucked out of primary growing regions. Never mind sea level rise. I agree it's a bit confusing, but I don't think they're claiming a link between the endorheic areas and sea level rise. At least not yet. Later they mention that they don't know where all this water went. What they're saying in that sentence is that the water loss in the endorheic areas over the 14 years was equivalent to the amount of water needed to raise the sea level by 4mm. Which means a lot of water was lost. z5, I doubt if the water was "lost". It's just a political live-wire to publicly admit how poorly we manage such a key resource. Many, probably most of the consumers of water resources, i.e. everybody. Are unwilling to bear the expense, re-direct the funding needed to invest for modernizing our hydraulic infrastructure. There are a multitude of special / selfish interests that cannot tolerate the idea that someone they do bot know, might possibly benefit in sime vague, unspecified manner, by the interest's sharing access to natural resources. In other words, they stole it so it now belongs to them as their monopoly to misuse and waste as they choose. Places with more people and more farms put more stress on aquifers and natural reservoirs. The water is still here, either in, on, or under the Earth's surface. It may change from liquid to ice to steam and to clouds, but it hasn't gone anywhere else. When water changes its form, it could wind up anywhere on or in the Earth. It is a volatile that is largely in a state of flux. Water may be disappearing from lakes, streams and rivers, but there is a chance that it has gone far underground into ancient rocks within the lower mantle and will not appear on the surface again until the rocks heat up hot enough that the water turns to steam and rises back to the surface or to the ocean through volcanos. The Earth is still in the throes of change, and humans must learn to deal with it as best they can. The key to these questions of managing any scarce resource? Must start with each & every one of us conservatively managing moderating our expectations. When we are selfish & greedy? We institutionalize controlling access of scarce resources. To castle our claims of ownership & monopolize distribution. The West Coast is a desert from Cabo San Lucas, all the way north to Spokane. What you believe tou know of as a desert are the impressions you remember from cinema. No, aquifers do not count. & it is stupid to pump them dry. Too many people choose to move to the California desert & then insist on planting turf lawns & trees as if they were still living 3,000 miles east! I blame the refugees. Midwesterners fleeing dying communities. Biblebelters fleeing conformity. Easterners seeking innovation.